Being a typical beauty enthusiast, after coming to the end of my last bottle of hair serum, I decided to search for something even better and more amazing than any I've previously tried. 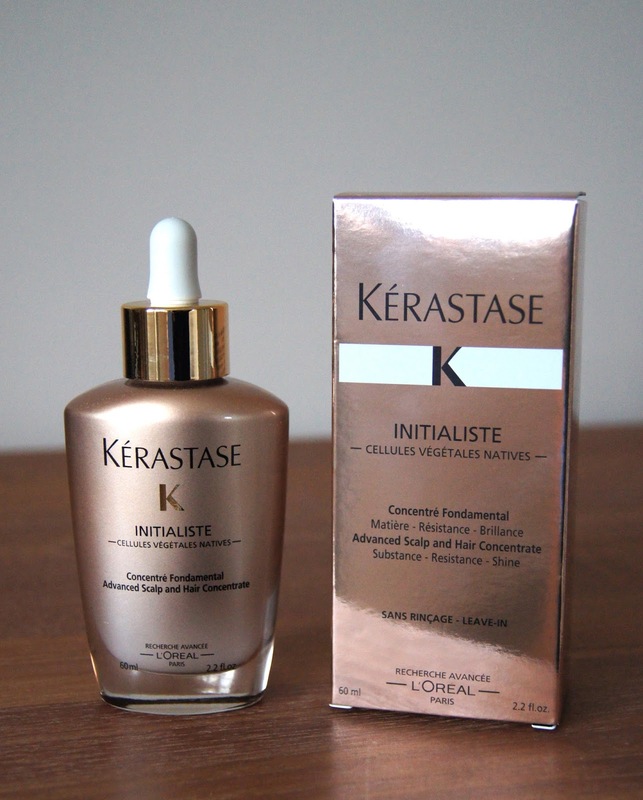 Initialiste from Kerastase caught my eye. 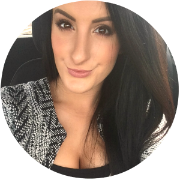 I've never sampled any of Kerastase's vast array of raved about products, so I thought that this concentrate would be a nice introduction to the brand. However, this is not your ordinary, run of the mill, hair serum. Usually when it comes to hair serums, the less-is-more approach is adopted. You avoid adding the product anywhere near the roots of the hair at all costs, focusing on the drier lengths and ends. Not with this one. You put this into towel-dried hair and, instead, massage it into the scalp and run the excess through the rest of the hair, before moving on to other products and styling. It feels odd. The first few times I used this, I was cautious. Now that I know it won't leave me looking like I've been dunked, head-first, into a vat of oil, I'm a lot less tentative in my application. No matter how much I seem to use, my porous locks just can't get enough, drinking it up and refusing to be weighed down by it. For a serum, this is extremely light and runny in consistency, allowing it to spread easily, without drowning the hair. Hair isn't left feeling greasy, sticky or tacky, as it feels almost like water. Of course, that has a downside and means that it doesn't feel as nourishing or luxurious, compared to others I've sampled. As to be expected from a high-end haircare brand, Initialiste has a pleasant, fresh fragrance to it, which isn't at all offensive. Using Initialiste isn't a walk in the park and does take some time getting used to. Rather then just quickly slapping some on, there is a specific process to follow, which is a bit of a faff in the busy mornings. Section by section, starting at the hairline, you drag the pipette through the hair, towards the back of the neck. As you do so, you distribute the serum onto the scalp, by gently squeezing out a little at a time and massaging it in with your fingers, as you go. In order to cover the majority of the scalp, you have to repeat the process across your head. Kerastase recommend dividing the serum between 2-3 sections of hair, if you have fine hair and 4-5, if you have thicker locks. Once done, you can use your fingers to really work the product onto the scalp and into the roots of the hair, to make sure everything is properly covered. Rather than work on a superficial level like most hair products, this formula penetrates the scalp and helps to create new hairs that are in better condition, whilst strengthening existing strands. Patience is a virtue with this one, as the serum will take time to work its magic on the scalp and those precious, new hairs. But, what are the results so far? I have to say, after using this religiously for a month, my tresses don't feel as conditioned or smooth as they have done when using other hair serums and oils. But, I do find that my hair needs washing less often and it seems stronger and more resilient. One thing I've really noticed is that my hair's gained a mirror-like shine and just looks so glossy. Frizz is still an issue and fly-aways haven't been banished completely, especially in the heat we've experienced as of late. So to combat this, I've starting using a drop of a separate hair oil after my locks have been dried and styled, giving Initialiste the job of a prepping serum or supplement, rather than a one-product-does-it-all, leave-in treatment. By using both in conjunction, my barnet is exactly how I want it to be. If you're after a single product that covers all bases, I wouldn't necessarily recommend this, unless your hair is extremely fine and can't handle too many styling products. I'm excited to see how, and if, this serum affects my hair further and if I do see any noticeable improvement in the quality, I'll let you know! I have very long hair and, to cover my scalp sufficiently, I find that I have to use 3-4 pipettes worth of serum per application, at least. A 60ml bottle isn't going to last me much longer and considering it isn't cheap, at £34, that does put me off sticking with it and repurchasing. In terms of packaging, the bottle is gorgeous for a hair product. The pipette is obviously necessary for the application process, but I wish all brand's serums/oils had one, to avoid any mess or waste. Being so luxurious has some downsides, though. Due to the opaque label, it's difficult to tell how much serum is left and the bottle weighs a tonne. Made from glass, it isn't practical for travelling and you can't just decant it into a smaller, lighter container, as the pipette is crucial to the use of it. Annoying! 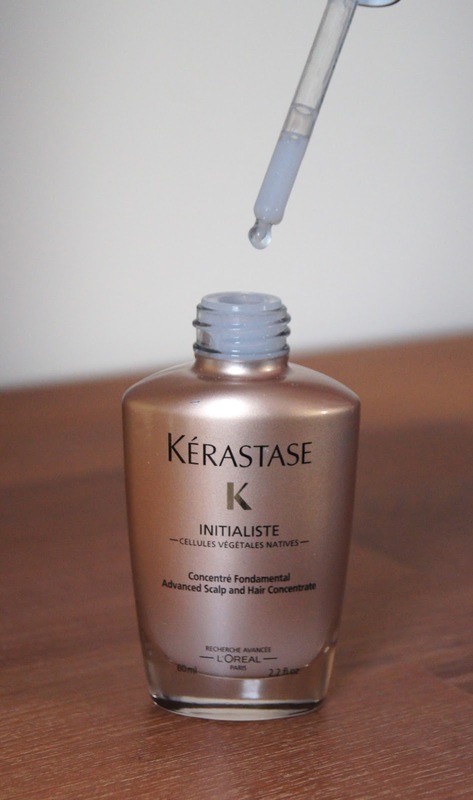 Have you tried Kerastase's Initialiste hair and scalp concentrate? Hi Alice !! :) Are you still using Initialiste? And is the result as good as claimed? I have thick long hair whuch is fairly dry, so I'm wondering if it'll be worth a try. Thank you. Hi Alice! I have very fine hair, not really limp. But im looking for something that will help with hair growth and strengthening, if not the Initialiste, what similar product would you recommend ? ?